Wait just a gol’ darn minute. How is it possibly Secret Recipe Club time again? Where the heck did my summer go? Didn’t I just post my last SRC post yesterday? Well, anyway, this month’s installment of the Secret Recipe Club features none other than Rhonda, the Kitchen Witch. Her about page is fascinating, and I’m totally jealous of all her travels. And, I love that she is unapologetic about being exactly who she is. Since I happen to be on a bit of a veggie kick, I headed straight to her vegetable recipes. She has loads of other categories for all you meats and sweets people. But, she gives a nice nod to us veggie lovers, too. So, what caught my eye? This did. That’s her brown sugar and smoked sea salt brussels sprouts, modified Mommy Bowl style – which means that I made them dairy-free and refined sugar-free. Brussels sprouts are a favorite veggie of mine, but the kiddo is less enthused. I’ve convinced him that they’re very good tolerable when shredded and flavored with lots of sesame oil, ginger, and garlic. But, I was hoping that the sweet + salty combo would have him begging for more of these. Apparently, though, I’ve taught him too well. I ate the rest. Myself. All at once. Yum. Place brussels sprouts in a microwave-safe dish and add 1 T. water. Microwave on high for 3 minutes. Melt coconut oil in a frying pan. Add microwaved sprouts and cook for 4 minutes on medium high heat. They will begin to brown. Be careful not to burn them. Sprinkle on sugar and salt and toss to melt sugar and caramelize it. (This happens quickly with palm sugar – maybe 30 seconds.) Serve. Top with some pecans for a protein kick if eating as a main dish. Check out the rest of the Secret Recipe Club offerings. Looking for more gluten-free recipes? Check out Gluten-Free Fridays. Those Brussels sprouts look and sound fantastic! I’ll be making these for me for sure. Son, my partner in eating Brussels sprouts, has left the nest again. 😉 I admire your son’s no sugar on vegetables stance, but I think he’s wrong on this recipe! Thanks Shirley. Your son should chat with my son. These brussels sprouts look fantastic. I love that golden color you got on them. Your son is funny! But more for you right? Take care! I love Brussel Sprouts, totally one of my favorite vegetables yet, I rarely make them. This should change, yours look amazing! I never used to be a huge fan. It’s only in the last couple of years that I’ve really grown to like them. The kiddo still prefers the shredded version – because of the texture. And, honestly, this was my first foray into serving them any larger than “sliced.” But, I’d do it again. I don’t mind the texture and love the flavor! These look great! I have family members that are very “anti-brussel” but, I’m like you – I’d just smile and say “More for me – thank you!” 🙂 So glad you got Rhonda’s blog – love her! Your Brussels Sprouts look delicious, I would just love them. Thanks for sharing and have a great day! Great Recipe. Looks wonderful! I love making recipes like this. Ha – I’m pretty sure the only way I could get my kids to eat these is with peanut butter! That’s not a bad idea! Sorry the kids didn’t go for it but I think they look great! This makes me think of Fall…can’t wait to try these. I am boo hooing about Summer coming to an end too. We just went school supply shopping, so it’s pretty hard to deny anymore!!! Brussel Sprouts are ALWAYS a good idea! I don’t think I’ve ever made brussel sprouts before but that beautiful caramel color makes it look quite delicious! I adore Rhonda’s site and am jealous of her adventures and her photog abilities. This sounds like a great recipe. A lot of the reveals today have me thinking about the holidays. I love brussels sprouts, and this is such a great way to make them – a bit of sweetness! Great idea for the coming fall! This recipe says “autumn” to me! What a great choice! You are making me wish that I bought the smoked sea salt I saw on sale. Ha! I had to buy it special for this recipe. I’d never used it before. But, I like it. Very much! These sprouts look incredible! 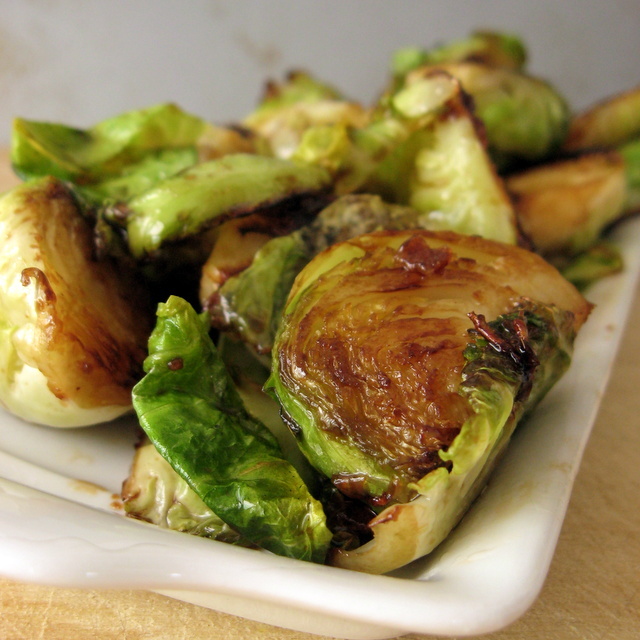 Love caramelized brussels sprouts – so good! Deanna, glad you found a recipe that works for you! Ha, youngest boy still barely chokes down brussel sprouts no matter what I do. Thanks for the kind words! I am a huge fan of brussels made this way. But, I have never used my coconut oil with them. Brilliant! Thanks! Love love love! As much as I eat brussels, I have never paired them with Coconut oil. Brilliant! caramelized brussel sprouts are by far one of my favorite things to eat in the world. i’ll bookmark this for when they come into season in the winter. oh wow those look outrageously delicious! i love brussels sprouts – they’re just SO good!! Remember, I have never tried brussel sprouts…maybe I can trade some apples for a taste?